Let’s be HONEST here, it’s NOT easy living with a reactive dog, especially when you are first starting out. Now that Oreo and I have been on this journey around 4 years recognizing her reactivity, training, and managing it, we find peace more often than years ago. Although this picture might not look PEACEFUL, it in fact is one of sheer joy for Oreo. 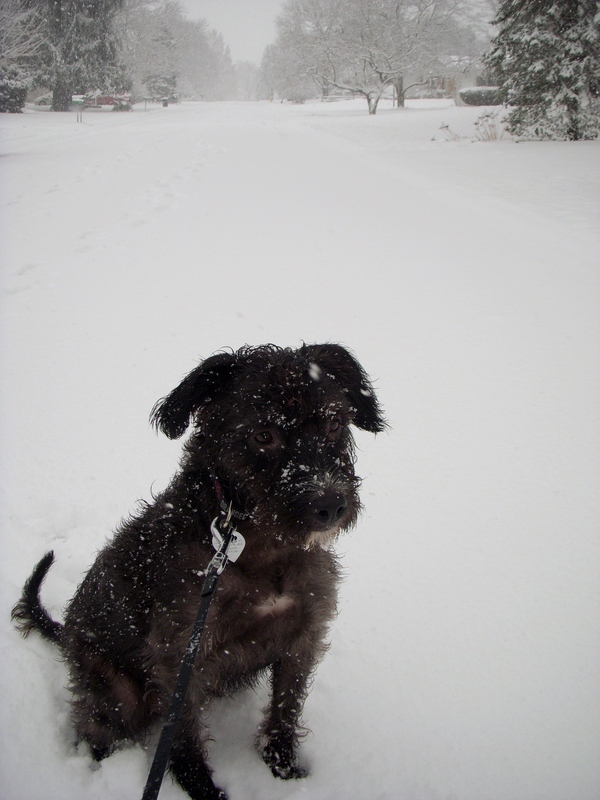 Today it snowed more than 10 inches on top of 15 already, creating a winter wonderful for furry fidos. 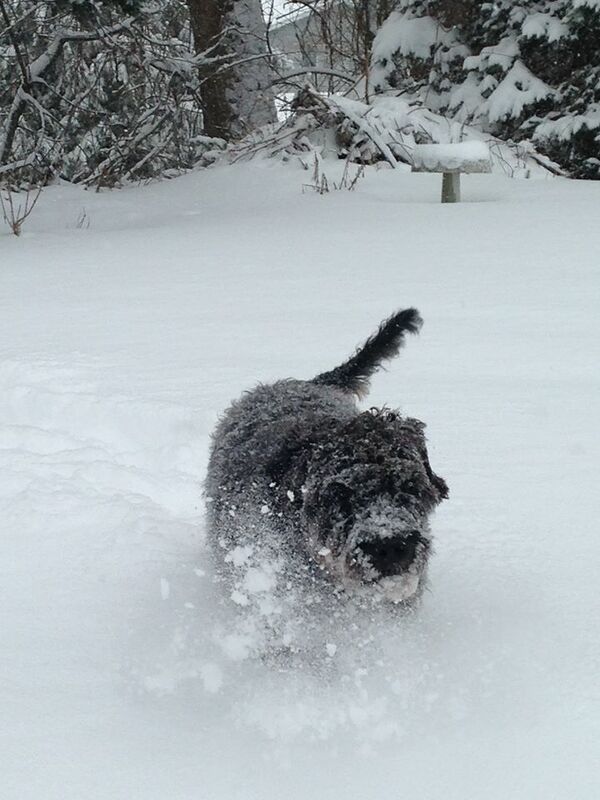 While some dogs don’t like the snow, Oreo LOVES it! What makes this time even better is she & I have no worries-NO DOGS OUT, STRANGERS, SQUIRRELS, OR ANYTHING FOR HER TO REACT TO! Finding peace can be difficult if you are just starting out or in the midst of training. Peace won’t come to you, YOU HAVE TO FIND IT. Sometimes, you even need to CREATE IT. Walking-if you love it, find somewhere your dog will not come in contact with many triggers. I’m not saying avoid triggers forever because as you know in training your dog may need to see a trigger (example : another dog) from a distance and accept treats. However, your dog also needs peace and definitely needs days to calm down after a stressful event. Where can I go walking, I live in a busy neighborhood/apartment/condo/city? Find an empty parking lot. I’ve walked Oreo around school yards on off seasons, company parking lots, and even parking lots of grocery stores that are out of business. Find a large, open space park. Some of my favorite parks were located near my condo where we used to live. After Oreo got attacked I couldn’t/wouldn’t walk her through our neighborhood. She froze up out of fear and quite frankly so did I walking around our neighborhood unaware when the next loose dog would attack. We found 2 favorite parks. Both parks weren’t super busy, and if one was busy, we went to the other. Both had lots of open fields, sports fields, and many exits. They both had various walking paths but also grassy areas we could cut through to avoid dogs or other triggers. Tennis courts. I’m not saying go into a tennis court that has a sign NO DOGS, but I am saying if you are lucky enough to have a neighborhood tennis court like we did, they are a great place to have your dog off leash if no one is around. Oreo loved her time running free, chasing tennis balls. We also practiced recall, my husband and I on separate sides of the court, calling her and rewarding her. Inside Your House-Depending on your dog’s reactivity, you may be able to find peace in the home. Close the shades, put up window film, whatever works. If your dog is reactive when looking outside, don’t let them. If you aren’t working on training-don’t let your pup learn to bark at triggers (they will think they made the mailman/squirrel/dog go away). Turn on the tv, radio, a white noise machine or fan. We always leave a fan running at night because our neighbor’s dog that barks. If the fan is off, Oreo will bark. If the fan is on, we sleep through the night. Make a safe place for your dog, especially if you have kids. It could be a crate, a dog bed, or a gated area or room where your dog can go to feel safe and relax. This is also a good place for you to find peace if someone arrives or you feel your dog can’t handle a stressful situation, have them go to the peaceful place. No matter how much stress you or your pup is in, it’s always important to cool down and FIND PEACE or MAKE IT. Reactive dog parents go through a lot of stress, take some time for you and your pup to relax!